Miranda, transfixed by the mountain. 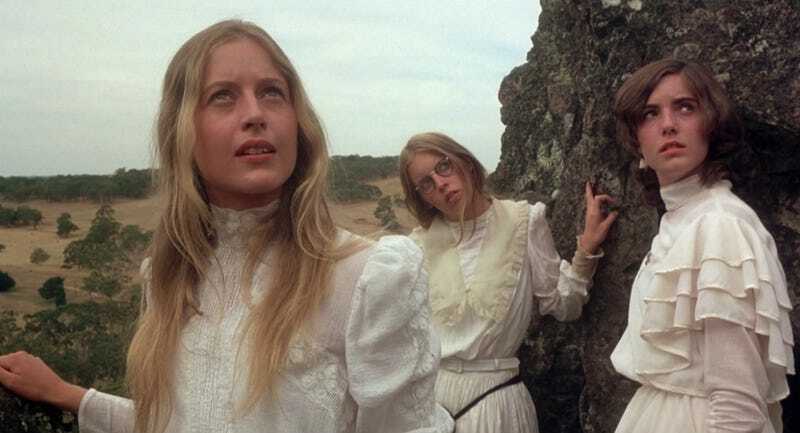 Starting this Friday, May 25, Amazon will stream a six-episode series based on Australian author Joan Lindsay’s 1967 classic novel Picnic at Hanging Rock. But no new adaptation will ever replace Peter Weir’s 1975 film version—still one of cinema’s most gorgeous and eerie mysteries. It opens with a title card letting you know exactly where you are and what you’re about to see: It’s Valentine’s Day, circa 1900, and a group of Australian schoolgirls are about to visit the titular rocky mountain... where several of them will “disappear without a trace.” That’s a lot of exposition to go into the movie with, but Picnic at Hanging Rock is less concerned about its plot, and much more interested in its imagery and tone. Of course, you do get a huge clue about what to expect there, too, thanks to the film’s opening line, a slightly bastardized recitation of one of Edgar Allen Poe’s most famous poems: “All that we see or seem/is but a dream within a dream.” It frames the movie within its own reality, with all the logic of a dream and more than a few night terrors. The young women of Appleyard College are introduced as a giddy group, but a few students stand out—mainly the intuitive, ethereal beauty Miranda, but also Sara, the wide-eyed orphan who adores her, and chubby tagalong Edith. Sara’s being punished, so she’s excluded from the excursion to Hanging Rock, but the rest of the girls leave their paper Valentines behind and head out, excited when their headmistress, the stern Mrs. Appleyard, allows them the impropriety of removing their gloves once they’ve passed through the nearby town. They’re unworried, however, about Mrs. Appleyard’s fraught warnings about the dangerous ants and snakes they’re liable to encounter on their field trip. Still, a sense of malevolence emanates from the natural world. Once the party arrives at Hanging Rock—an ancient, untamed place that juts up from the ground like a row of teeth—pocket watches stop, and time seems to stop, too, as four of the girls, led by Miranda, break away from the group and go exploring. Watch out for poisonous snakes, though. These sequences are filmed with a golden hue and gauzy lighting, and the dreaminess is enhanced by a score that leans heavily on the talents of pan flutist Zamfir. (Also adding to the movie’s general out-of-body-ness: The fact that several of the girls’ voices were later dubbed in by more experienced actresses.) The foursome is spotted from a distance by a pair of young men who are understandably startled to see schoolgirls wearing prim, frilly white dresses hiking through the forest: rich Englishman Michael, who’s instantly mesmerized by Miranda, and local kid Albert (notably, played by a young John Jarratt, who’s now best-known for his terrifying turn as the psycho in the popular Aussie horror series Wolf Creek). As the boys stare in awe, the girls move through the forest and begin climbing up the rock formation. There’s a fairy-tale quality to their journey as they ascend, and then they start feeling dizzy from the sun and probably also the rock’s strange powers. Something compels three of the girls to remove their stockings and shoes (gasp!) and march into a rocky crevasse. Lone holdout Edith gapes in shock before screaming her way back down the mountain, passing a teacher who’s mysteriously drawn in the same direction as the girls, and who vanishes along with them. The saga of missing children—particularly girls, and particularly pretty young white girls—has become an incredibly common theme in crime dramas nowadays, and while Picnic at Hanging Rock hits some of the expected beats (detectives, a search party, rampant rumors and gossip), its central mystery reverberates on a more cosmic level than most police procedurals. There’s a repeated line, “Everything begins and ends at exactly the right time and place,” and the sense of borders being crossed also repeats—be they between girlhood and womanhood, between teachers and students, between Australia’s colonial settlers and the unfamiliar wilderness that surrounds them, or even between life and death. It’s a constant theme that goes back to that Poe quote. Is this real, or are we in a dream... or a dream within a dream? The volcano is dormant, but Hanging Rock is still full of secrets. While one of the girls is eventually recovered (she remembers nothing about her experience, naturally), the other three missing women, including the luminous Miranda, remain lost. In the emotional aftermath, Mrs. Appleyard’s flinty Victorian facade begins to crumble, and as she grows more unhinged, her cruel treatment of Sara escalates to the point of psychological torture. Before the end, both women die mysteriously—their already-troubled relationship pushed to deadly extremes by the Valentine’s Day tragedy. But the biggest takeaway from Picnic at Hanging Rock is realizing we’ll never know what actually happened on the mountain—did the women just fall into a hole and die? Were they absorbed by the elements? Did they transform into swans? Are they still out there... somewhere?—and yet still being totally satisfied by the darkly disturbing yet intensely beautiful puzzle the movie leaves behind.